The American Institute of Chemical Engineers (AIChE) held its 2017 Annual Meeting in Minneapolis, MN from October 29 – November 3. As the world’s leading organization for chemical engineering professionals, the AIChE Annual Meeting is a widely respected educational forum for chemical engineers covering a broad spectrum of topics relevant to cutting-edge research, the development of new technologies, and emerging areas of growth in the field of chemical engineering. 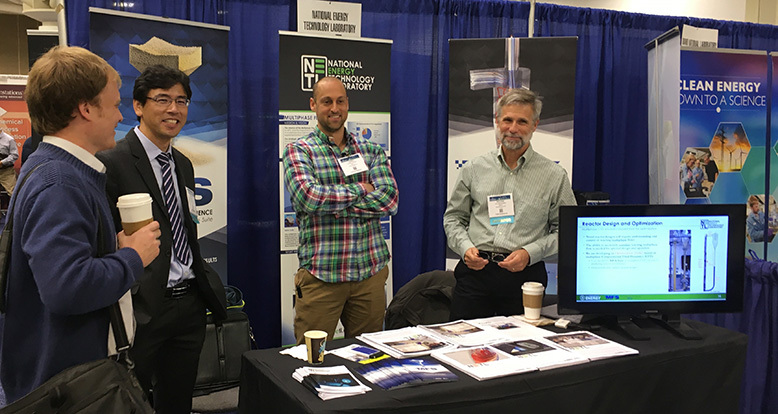 Representing NETL’s Multiphase Flow Science Team, Tingwen Li, Xi Gao, Liqiang Lu, and Bill Rogers hosted a booth on the event floor. NETL’s Dan Haynes was also in attendance representing NETL’s Reaction Engineering Team. The MFS booth was part of the AIChE meeting exhibits focused on Process Intensification and Modular Chemical Processing. The exhibit emphasized the use of NETL’s MFiX Suite of multiphase flow software for reactor design and optimization, including use of the new Optimization Toolset. The Optimization Toolset will be part NETL’s Nodeworks software and is currently undergoing final testing prior to formal release.